Samsung at its New York event announced its latest smartwatch alongside with the Galaxy Note 9. The device which is simply called "Galaxy Watch", is based on Samsung's Tizen Wearable Platform 4.0. It is no surprise seeing Samsung disputing Wear OS again and embracing its in-house wearable solution, which of course is perfect. The wristwatch comes in two variants; a 46mm model with a circular 1.3-inch Super AMOLED display, and a 42mm model with a smaller 1.2-inch Super AMOLED display, both having a resolution of 360x360 pixel and protected by Corning Gorilla Glass DX+. These have rotating bezels and are military grade MIL-STD-810G certified for durability against high and low pressure, temperature and humidity. Moreover, the Galaxy Watch is IP68 certified for water and dust resistant as well and it can survive in 5ATM. It has an inbuilt GPS for outdoor tracking and it also comes with a new stress management tracker that automatically detects high levels of stress and offers breathing exercises. Heart rate sensor is not left behind for heart rate monitoring. Its functionality as a fitness tracker further extend to its ability to track all levels of sleep, including REM cycles, calorie, and 39 other workouts with custom preference. The device can be use for mobile payment with supports for Samsung Pay, thanks to NFC and MST onboard. 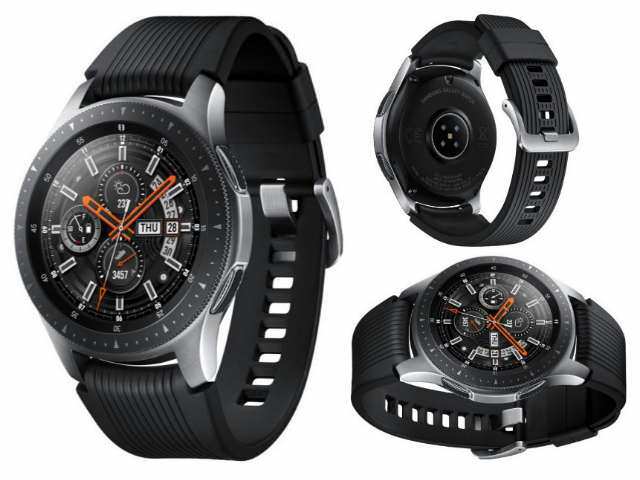 Powering the watch is a dual-core Exynos 9110 processor clocked at 1.15GHz, paired with 768MB of RAM and 4GB of internal storage, for the Bluetooth version. The LTE version comes with an 1.5GB of RAM. The LTE and Bluetooth versions common connectivity are WiFi 802.11 b/g/n, A-GPS and GLONASS, apart from the aforementioned NFC, MST, and Bluetooth 4.2. Sensors onboard includes Accelerometer, Gyroscope, Ambient Light, and Barometer. Supported mobile phone operating system that the Galaxy Watch can be paired with are Android 5.0+, iOS 9.0+, and iPhone 5 and above. It has a speaker for music listening and mics for voice command. The 46mm model is powered by a 472mAh battery that can last up to 168 hours in low usage mode and more than 80 hours in normal use, while the 42mm model draw its power from a 270mAh battery that can renders up to 120 hours of use in low usage mode and more than 45 hours in normal use. The battery can be charged wirelessly via induction plate (WPC). The Galaxy Watch 46mm (WiFi) is painted in Silver color, wearing a price tag of $349.99, while the 42mm (WiFi) comes in Rose Gold and Midnight Black colors and is priced at $329.99. It will be available for purchase in the U.S from August 24th. Pre-order begins on August 10th. The LTE version is expected to launch later this year.